january dental marketing ideas – Hayden Consulting – Where Your Success in Business and Life Matters! Now is the time to think seriously about any troubles, concerns and problems that occurred during the year that you do not want to repeat in the new year. What problems would you like to see solved? Take steps to make any needed changes or improvements. For more ideas to get you started visit here: Improve your Office – Make a change! Also, think about all of the things that worked well and how you can repeat them or even improve upon them in the new year. Celebrate your successes!! Do not delay, put down on paper all of your thoughts and plans to make 2017 a better year for you and your practice. Do include your team in this plan, ask them what their ideas are to make 2017 a more productive and happier year for all. Now, here are some Marketing & Practice Management Ideas to help make January your Best Month Ever! Insurance Maximums: Many of your patient’s dental insurance maximums renew on January 1. Phone, email or text your patients with a friendly reminder of their renewed benefits and make a reservation for them to come in for their hygiene visit or incomplete treatment with the doctor. Hygiene Patients: Are you pre-appointing hygiene visits? If not, January is a good time to make this a goal for the office. While you have the hygiene patient in the office, schedule their next 3, 4 or 6-month visit. Avoid saying “would you like to schedule your next appointment?” Many will say no. Instead, say this: “Let’s go ahead and schedule your next visit.” Assume they want to schedule their next visit. By the way, your entire team needs to be on board with pre-appointing your patients. It can be done! National Clean Off Your Desk Day: 9 (2nd Monday) Clutter represents indecision. Make a decision to get rid of the clutter! That includes any sticky notes attached to computer monitors, coats/sweaters hanging on the backs of chairs and fast-food drink containers sitting out on the counters. Fun at Work Day: 27 (Last Friday) You’ll find many ideas here on how to have fun at work. Next, we have few internal and external marketing ideas, some are educational and some are just for fun. All are presented to exceed your patients expectations, help to create value for better dental health and get people talking about you to their friends, family members, co-workers, and neighbors. Send a coffee truck to local businesses/schools – What a great surprise and welcome treat for many local businesses. Be sure to take pictures that can be shared on your social media sites. January is Be Kind to Food Servers Month – Visit some local restaurants and present servers with a “We Appreciate You” gift. Gift Ideas: Toothbrush bag, lip balm , pens, etc. All items should be imprinted. Consider a drawing they can enter to win free teeth whitening. Drinking teas such as green tea can be very good for one’s dental health. Does Tooth Sensitivity hold some of your patient’s back from enjoying their favorite hot beverage? Show them how you can help relieve/eliminate tooth sensitivity. This will give a nice boost to your production too! So there you have it, a few dental marketing ideas for January. Please be sure to comment below with any other ideas or reminders you have for the month of January. I LOVE hearing from you! If you have not yet subscribed to receive my Free Dental Marketing Ideas each month, please do so today. What does the start of 2016 look like for you? With a clear vision and plan, are you excited and hopeful for the opportunity to exceed last years production and collection goals? Are you concerned that it will be a repeat of last years disappointing numbers? Last year did you struggle with any of the following? Low treatment plan acceptance from your patients. Not knowing your active and inactive patient numbers. Hygiene continuing care reports were a nightmare. Too many holes in the schedule. Too many patients left the practice and you don’t know why. Not enough time to keep your office social media sites current. Don’t struggle another minute, plan now to make 2016 your BEST year yet! Get whatever help and training you need and want to make the necessary improvements. Feel free to contact me for a complimentary, no obligation consultation at bhaydenconsulting@gmail.com. Ideally, daily, weekly and monthly efforts should be made to develop and maintain relationships with your patients in order to keep them active. However, if for whatever reason your inactive patient database is growing – take steps now to welcome those patients back in to the schedule. You can start by sending a We Miss You reactivation letter. You may not realize how long it has been since we’ve seen you. We understand how hectic life can be, and it’s easy to put off a visit to the dentist. We sincerely care about your dental health, and we’re concerned when you miss out on your regular dental visits. With regular check-ups and good home care, dentistry can help you maintain your oral health – and overall health. If you haven’t been in because you are seeing another dentist, please let us know. This way, we can update our records and we’ll know you’re receiving your all important dental care. A welcoming smile is waiting for you! Include a deadline to respond. Use a handwritten colored envelope (Grab their attention!). Have two offers: One for your patient and one for a friend, family member, co-worker or neighbor. Make a call to the patients about a week after mailing the letter. Be sure to document all attempts at contacting the patient and the response. Include Social Media & Office Contact Information. Betty Hayden Consulting is ready to help you create a fantastic marketing plan that will surely exceed your patients expectations and or help you with your practice management concerns and goals. Contact Betty at bhaydenconsulting@gmail.com to set up your no obligation, complimentary consultation. December is a great time to make your to-do list for any wanted and needed improvements to your office and to set your production, collection and new patient goals for the new year. Do include your team in this plan, ask them what their ideas are to make 2016 a more productive and happier year for all. Do not delay, put down on paper all of your thoughts and plans to make 2016 a better year for you and your practice. I would like to help, here are some dental practice management and marketing ideas for January. Insurance Maximums: Many of your patients dental insurance maximums renew on January 1. Phone your patients with a friendly reminder of their renewed benefits and make a reservation for them to come in for their hygiene visit or incomplete treatment with the doctor. Next, we have few internal and external marketing ideas, some are educational and some are just for fun. Both are presented to exceed your patients expectations, help to create value for better dental health and get them talking about you to their friends, family members, co-workers and neighbors. I’m not going to take my…”Crowded Teeth”,“Yellow Teeth”,“Bad Breath”,“Sensitive Teeth”,“Snoring”,“Headaches”, anymore! – Show your patients how you can help. Jan 11 – Cigarettes are hazardous to your health day. Promote the Smoking Cessation Programs your office offers. Keep track of your patients that are trying to give up cigarettes and be sure to celebrate your successful “quitters”! National Soup Month and Soup Swap Day – January 16th. – Team Building Opportunity: Each team member brings in a slow cooker of soup. Enjoy a nice lunch together. – Swap soup recipes on your social media sites or in the office. – Delicious idea for Winter: “Warm-Up Wednesday’s” Set up a slow cooker with soup or chili every Wednesday for your patients to enjoy. (Have recipe cards ready to share) Your patients will love the free food. January 29th – National Puzzle Day – You can purchase puzzles at your local dollar store and give away to your patients as unexpected gifts. Tie a ribbon around the boxes and attach your business card or office information to it. Even if your patient doesn’t want the puzzle, they can give it away as a gift on your behalf to their friend, family member, co-worker or neighbor. P.S. Why not go ahead and put down in writing all of your marketing and practice management plans for the entire first quarter? For sure start planning for February’s Children’s Dental Health month. For some idea’s check out my Dental Marketing Ideas for February and March. Now is the time to create a marketing and practice management plan of action for 2014. Think seriously about any troubles, concerns and problems that occurred during the year that you do not want to repeat in the new year. What problems would you like to see solved? Any office space issues? Team member/staffing concerns? Need for updated equipment? More money?More New Patients?, Etc. Also, think about all of the things that worked well and how you can repeat them or even improve upon them in the new year. Do not delay, put down on paper all of your thoughts and plans to make 2014 a better year for you and your practice. Do include your team in this plan, ask them what their ideas are to make 2014 a more productive and happier year for all. If your plans include a campaign to bring in inactive patients this letter that I shared last year is a great one to encourage your inactive patients to come back. You can read it here. National Hot Tea Month – I know I shared this one last year but it’s a good one to share again this year. Why? Because it’s easy, inexpensive & effective! Does Tooth Sensitivity hold some of your patient’s back from enjoying their favorite hot beverage? Show them how you can help relieve/eliminate tooth sensitivity. National Skating Month – Team up with a local roller or ice rink for passes to give out as prizes for your younger patients. Thank God It’s Monday” Day: 6 – Purchase the book “Thank God It’s Monday” to share with your employees. Start the new year loving Monday’s! National Clean Off Your Desk Day: 13 – How are the desks looking in the office? Time to clear some clutter? Get rid of those sticky notes that are hanging around? Look at your work space through the eyes of your patients…. even if they don’t see your desk, this is a great day to organize and clear the chaos. 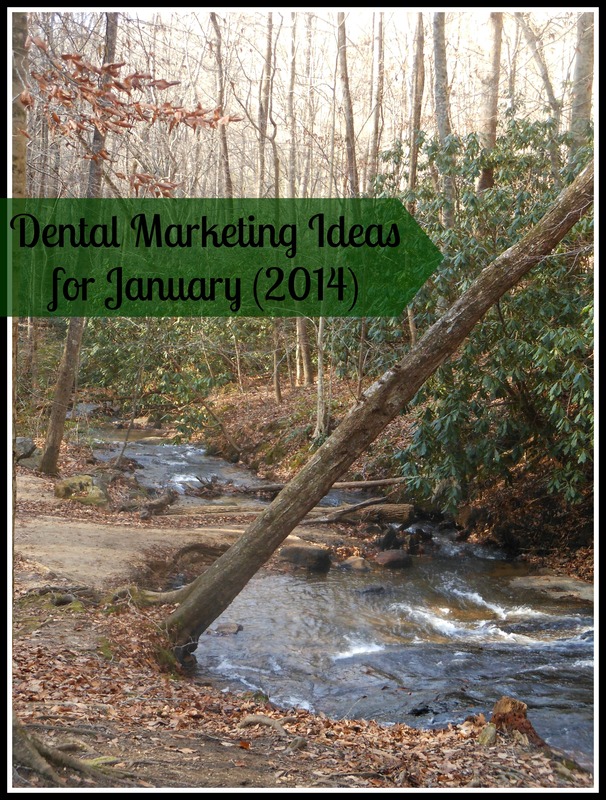 If you’re looking for even more ideas, please visit my January 2013 Dental Marketing Ideas here. It is my wish that 2014 be your Best Year Yet! As always, I would love to hear your comments on this month’s ideas!